Since 2009, ADRC has been conducting DRR Policy Peer Reviews to help develop the DRR capacity of ADRC-member countries through the promotion of information sharing and the strengthening of relationships among member countries. The target project selected for review this year, the sixth since the Peer Review process was launched, is a project titled "Integrating Cultural Heritage and Disaster Risk Reduction (Disaster Preparedness and Sensitization Training program on Dzong (Fortress) Safety at Dagana)". 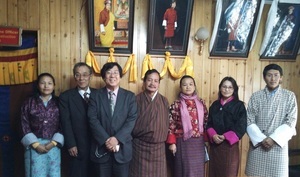 After the country report was submitted, a reviewer team comprised of the following two individuals visited Bhutan to conduct interviews: Ms. Yuko Nakagawa (Executive Director, NPO SEEDS Asia), and Mr. Junji Moriwaki (ADRC Researcher). The team visited the Ministry of Home & Culture Affairs Department of Disaster Management (DDM) and so on, which is involved in DRR activities, to examine its DRR development efforts in Bhutan. The team also conducted inspections of Dagana District, where is a place of DRR drills were carried out, after which it prepared a draft report of its survey results highlighting its specific findings (e.g., "5 days training increased the awareness and knowledge on fire safety and DRR to monks and administrative officers in Dagana Dzong which was not there. ", "Good coordination among relevant agencies such as DDM, fire division, and district administration made smooth implementation." and "Well understanding of the Governor and Disaster Focal person of the district office for the need of DRR and willingness for their continuous efforts.") and recommendations (e.g., "Fire is not the only hazard in Dagana. Training and raising awareness on multi hazard, especially on earthquake should be sought." and "Collaboration between school and community on DRR drills can be sought."). A workshop was also held to gather opinions and comments used in finalizing the report as well as to introduce the importance of community involvements and education in schools for enhancing the DRR, with local participants. This proved to be a very good opportunity for participants to share information and ideas with one another. After its survey mission ends, the reviewer team compiles a survey report, which it sends to the countries examined as well as to other ADRC member countries, so as to enhance cross-fertilization. ADRC would like to express its sincerest gratitude to all of those who have made such important contributions to this project. ADRC, conducting the research on the Asian and Pacific nations' needs to satellite data for the disaster management, visited Ministry of Disaster Management & Relief in Bangladesh on 4 February and Ministry of Home & Cultural Affairs in Bhutan on 5. 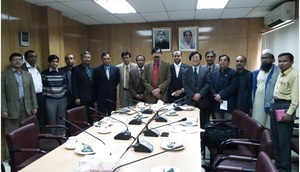 In Bangladesh, experts for disaster management, satellite agency and mapping agency attended the meeting. In Bhutan, experts for disaster response attended the meeting. 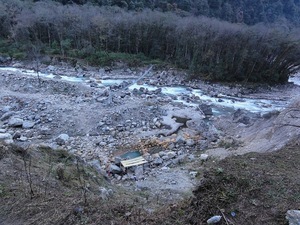 Due to the topographical condition and the lack of the adequate infrastructure, the two countries showed strong interests in the utilization of the satellite images for DRR including the emergency observation of the disaster area, such as flood, sediment disaster and Glacial Lake Outburst Flood (GLOF). Bangladesh has been active in collaboration with national space agency, In Bhutan, ADRC gave a status update on the Sentinel Asia Project and shared ideas about specific ways that satellite images can be (or are being) used in disaster mitigation activities. 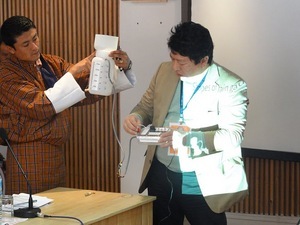 ADRC selected Bhutan as the site for a pilot project of GLOF, and had the workshop of public awareness on GLOF and earthquake in collaboration with Department of Disaster Management (DDM) at Punakha, Bhutan from 24 to 25 February 2012. On 24 Feb., 20 students of KHURUTHANG INSTITUTE OF ELECTRICAL ENGINEERING were participated with the disaster prevention class. ADRC made following lectures with video and PowerPoint presentations. The end of morning session, ADRC handed over the River Gauge Making Manual and "BOKOMI guide book" made by Kobe city government for further activities in this school. The demonstration of "Iza! Kaeru Caravan" was held in the afternoon. On the next day, students became as facilitators for the workshop at the junior high school, approximately 250 students including primary school children participated. DDM committed that they would like to conduct this activity not only Punakha area but all of Bhutan. ADRC and Plus arts gave most of materials to DDM, and asked further promotion of this activity and submission reports to for their implementations. 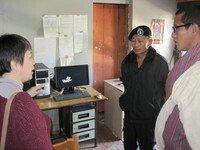 ADRC hopes their active promotion on disaster education in Bhutan. The International Conference on Disaster Management and Cultural Heritage "Living in Harmony with the Four Elements" was held on 12-14 December 2010 in Thimphu, Bhutan. This was the first large-scale international conference to be held in Bhutan; it attracted 55 international participants from 23 countries, as well as 98 participants from around Bhutan, including His Excellency the Prime Minister Lyonchhen Jigmi Y. Thinley, and Ms. Margarita Wahlstrom, the United Nations' Assistant Secretary-General for Disaster Risk Reduction and Special Representative of the Secretary General for the implementation of the Hyogo Framework for Action. This conference was organized by the Department of Disaster Management and the Department of Culture, Ministry of Home and Cultural Affairs, Bhutan, and was supported by UN/ISDR, UNESCO, UNDP, GFDRR, and the World Bank. During this conference, participants discussed the following five themes. The results are reported in the Thimphu Document. a. Policy and Institutional Framework for Disaster Management b. Technical Aspects of Disaster Management c. Traditional Practices for Disaster Risk Reduction d. Post-Disaster Recovery of Cultural Heritage e. Capacity Building and Networking This document will be reported to the next Global Platform in Geneva on 8-13 May 2011, and the Climate Summit for a Living Himalayas Bhutan 2011. The ADRC dispatched Mr. Masaru Arakida, Senior Researcher, to introduce historical disaster management techniques and community-based early warning systems, and to propose an implementation strategy for Bhutan. After the conference, he visited Punakha and paid a courtesy call on the provincial governor, investigated damages caused by flooding in 2009, and visited candidate sites for rain gauges along the upstream areas of the Mo-chu River. ADRC will hold a workshop on disaster education and disaster drills for residents, including students and monks, in the Mo-chu area, and also will hold a class to teach people how to make rain and river gauges that can be managed by the local community. Through many of natural disasters experiences, Japan has accumulated knowledge of dealing with disasters and developed its expertise together with advanced policies and technologies in the area of disaster risk reduction. This unique experience provides Japan with many valuable knowledge and expertise that it must now endeavor to share effectively with other members of the international community. From this point of view, this project is launched by the Cabinet Office of Japanese Government last year. Mongolia and Indonesia were selected as target countries of the FY2010 project. The ADRC dispatched mission teams to those two countries to discuss the details of the project activities, including determination of the work schedule. On 1-9 December 2010, the ADRC team visited Mongolia and conducted preliminary survey for the proposed project activities on earthquake disaster education. The team visited National Emergency Management Agency (NEMA), two target schools to conduct disaster drill, and other related organizations. Through discussion, the ADRC and NEMA agreed to have pre-training course in Japan at the end of January 2011, and to have workshop of earthquake disaster education in the middle of February 2011. On 19-22 December 2010, the ADRC team visited Indonesia to learn detailed ideas on the promotion of disaster education to mass media, the project theme proposed by Indonesia. They concerns mass media casualties caused by pyroclastic flows of Mt. Merapi eruption, and inadequate Tsunami early warning information distribution. The team visited the Indonesian National Board for Disaster Management (BNPB) and The Indonesian Institute of Sciences (LIPI), and interviewed some mass media. Through the discussion, the ADRC and BNPB agreed to have training course in Japan and workshop in Jakarta in February or March 2011. Also, we agreed to conduct survey on mass media's awareness on natural disaster before the workshop. ADRC has initiated a pilot project of DRR Policy Peer Review this year. This new project is aimed at developing DRR capacity of ADRC member countri es by sharing information and strengthening the relationship among member countries. The topic for this year has been selected as "disaster education and public awareness" and Bhutan and Thailand for countries to be reviewed. After the submission of country reports by two target countries, reviewer teams, which consist of one officer from a member country, one expert from Japan and one from ADRC per a target country, have visited target countries to conduct surveys. 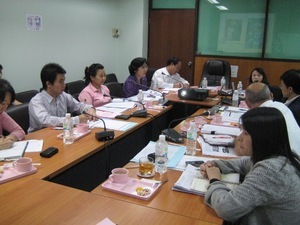 During the two day survey, the team visited various ministries and institutions, including Department of Disaster Prevention and Mitigation (ADRC's counterpart in Thailand), Ministry of Education, National Disaster Warning Center and Thai Red Cross Society to examine how they have been making the efforts for disaster education and public awareness by government and non-governmental organisations in Thailand. Another reviewer team composed of Dr. Koichi Shiwaku of Earthquake Disaster Mitigation Research Center of the National Research Institute for Earth Science and Disaster Prevention (EDM-NIED), Mr. Arshad Nawaz Chheena from Pakistan's National Disaster Management Authority and Ms. Maki Yoshida of ADRC visited Bhutan on 25-26 November 2009 and conducted the survey by learning about their ongoing efforts for disaster education and public awareness by visiting Department of Disaster Management (ADRC's counterpart in Bhutan), Department of School Education, Department of Geology and Mines, Standard Quality and Control Authority and UNDP office. This project aims at developing the mutual learning process among the ADRC member countries in stead of one-way learning. After the survey missions, reviewer teams will compile survey reports and send them to target countries and then to ADRC member countries to enhance cross-fertilisation. In addition, ADRC will further elaborate on the programme based on the results of this year's project for possible improvement in the ways this project is conduced for coming years. ADRC would like to express its sincerest gratitude to all of those who have made precious contribution to this project this year.